A Guide to Online Course Design offers faculty and professional staff a practical and easy-to-follow model for creating exceptional online courses that focuses on quality standards in instructional design, transparency in learning outcomes, and learner persistence. A comprehensive resource, the book includes effective, research-based instructional strategies to motivate online learners and help them become more self-directed. 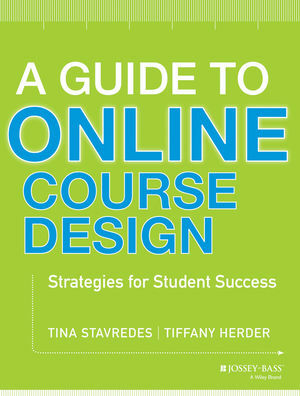 A Guide to Online Course Design emphasizes quality standards and removing barriers to learners’ persistence, which ensures online courses meet the needs of online learners as well as distance education initiatives. Tina Stavredes has more than fifteen years of experience in online learning. Currently, she is chief academic officer of online services at Corinthian Colleges, Inc. Formerly, she was with Capella University serving in a number of roles including director of curriculum, associate dean, chair, and as a Harold Able distinguished faculty member. Her experience includes managing high-performing online faculty members and developing quality online courses. Tiffany Herder is a curriculum and instructional designer, collaborating with faculty and cross-functional staff to create quality learning experiences. She has worked in online learning for more than ten years. Formerly, she was a senior instructional designer for Capella University.